Blogcritics sent me on a bloggers’ press junket to interview the cast and go behind the scenes at Law & Order‘s Chelsea Piers studios. Check out all the action here. 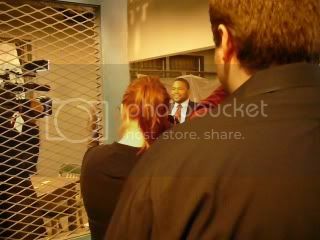 In the photo, actor Anthony Anderson (in the red tie) shows us the interrogation room. This entry was posted on Sunday, November 1st, 2009 at 10:55 pm	and is filed under New York City. You can follow any responses to this entry through the RSS 2.0 feed. You can skip to the end and leave a response. Pinging is currently not allowed.